Jana: Tell us a little about yourself. 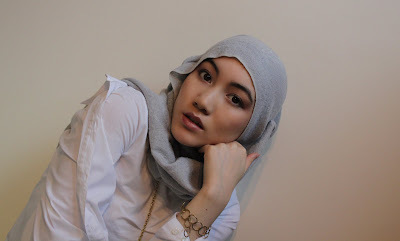 Hana: My name is Hana Tajima-Simpson, I'm 23, with a Japanese father and English mother. I have a pretty mixed background, both my parents are artists, so I grew up in a really creative environment. I didn't study fashion for that long, and although I am a self-confessed geek I never really got along with formal education. I didn't want to lose my love of designing, so I left the fashion course I was on. It's less of a contradiction than it sounds! Jana: Take us through the journey of creating your own fashion label. How did it all start? Hana: As long as I can remember I've been designing, even if was using my hand-operated heirloom of a Singer to patch pieces together. You can blame my husband and his incredible enterprising talent for turning the label into a business. It's a long, hard process; you have to work unbelievably hard for no money for a long time. I know I sound like a cynic, but it has to be an obsession, something you can't not do. Now that it's really real I'm still trying to get my head around it, I think I've been stuck in my studio for too long. Jana: What's involved in creating a piece from start to finish? Hana: It can start with something as small as a detail, fabric, or as abstract as an feeling. Something like feeling a dress hem fluttering around your feet. You wouldn't believe the hours I spend daydreaming or lying awake at night mentally exploring details and designs. If I get twitchy and excited then I'll start sketching. I always leave a design a little while before I come back to it, just to make sure I wasn't crazy the first time, I want every piece to look fresh even if I go back to it a hundred times. Then it's all the technical stuff, patterns, then samples. We've chosen an amazing team that help bring it all together, it's important, especially when you're working on production. Jana: What do you think is missing from the modest fashion market that you're trying to cater for? Hana: I think there's a lack of connection, and people are jumping to label and categorize things. I want to identify with a piece, to feel like it was made just for me, you can't do that if in your head you are designing for this or that 'target market.' A lot of times it just feels like a lack of creativity and imagination, it's that sort of 'copy, paste' design concept. Jana: Do you prefer to wear your own designs, or do you still shop elsewhere? Hana: I love to wear my own designs, really, I get that nervous excitement waiting for samples to arrive. The best thing is finding new ways to wear a piece, with a little styling you can create a look entirely different from what I had in mind when I designed it. But I don't think I'll ever loose the thrill of a perfect vintage find, and I'm still waiting to get my hands on a McQueen piece! Jana: As a designer, how do you manage the fine balance between creating a stylish and fashion-forward piece, with modesty? Do you ever feel that one can compromise the other and how do you overcome that? Hana: I have always found the vision of beauty in Islam incredibly inspiring. The thought that there can be a protection and practicality, but also a subtle, infinitely deep beauty in a garment is an incredible platform for creativity. The best design is when you can't separate the two elements; style and modesty. Compromise shows up in a design, it's not good. Jana: Many clothing brands aimed at Muslim women tend to stick to a niche of 'Islamic fashion', rarely actively branching out to a non-Muslim clientele. Maysaa seems to be different in this respect. Can you tell us more about this? Hana: I really give of myself when I design, so when someone feels a connection to one of my pieces they are identifying with something very personal. It's the same with any other creative process, you have to find your own truth that people can relate to. If you design to a particular clientele you rarely make that connection because people aren't that easy to define or categorise. Women have such beautiful complexities, and that should be celebrated not ignored. The label is a reflection of a very mixed background, I've tried myself to separate it out, but in the end it's just one of those things. I love that it's a bit of a puzzle to me. Jana: What are your goals for the future? Hana: Our aim has always been about developing our connection with charities, from the outset we decided that 10% of our profits would be split between 2 amazing organisations Children's Hope and MADE Africa. They work in two of the poorest places in the world (Bangladesh and Kenya) working to house, feed, clothe and educate children and keep them healthy. These children really deserve nothing less. In the future we'd like to set up our own projects too, being more hands on in finding and helping those who have been neglected or taken advantage of. As a label Maysaa is just a baby. In terms of the collection I think of these first pieces as essentials, the bones of a wardrobe. I'm fired up to really push myself as a designer. There are a lot of exciting things in the future of Maysaa, I want to keep the core fresh and innovative. Our main line is my passion, I don't ever want to lose sight of that, but there are big things in the pipeline! Love Maysaa? Here's a special discount for Hijab Style readers. You can get 10% off your pre-order when you enter the code HIJABSTYLE at the checkout! Offer valid until midnight on Sunday 20th June 2010. Happy shopping, and do share your thoughts with us in the comments section below! the cloths are really amazing! I ll definitely order something very soon! :) good luck with your collection! My favourite modest fashion designer on my favourite blog! It made me grin from ear to ear when I checked this blog after waking up. Because yes, it's a ritual I rarely digress from. Hi! I really enjoyed reading this piece because hijabstyle and stylecovered are two of my favourite websites. I enjoyed reading the designer's words after seeing her collection. the creativity proccess and inspiration for desiging was intriguing: "It can start with something as small as a detail, fabric, or as abstract as an feeling. Something like feeling a dress hem fluttering around your feet." Masha'Allah ! Yes, and formal education can hinder people's creativity sometimes... I agree. Very nice! I wish I had a blog like this for America. I need more info. on Islamic fashion designers in the United States the way your blog caters to the UK community! You're blog is truly amazing! masha'Allah she's well talented! definitely gonna go places with maysaa, i'm sure of it!! I'm a massive fan of her! Very inspiring! I love the black scarf in the second set of images! i'm a big fans of hana. Luv her styles and fashions. God will bless u, InsyaALLAH! Love your page and Maysaa. Preordered dress straight away and can't wait to get it. Hope it is as nice as the pics!! Thanks for the discount! !